There is nothing I love more than a good steampunk book which is why Gail Carriger is one of my favorite authors. I'd follow her to the ends of the earth and back again. 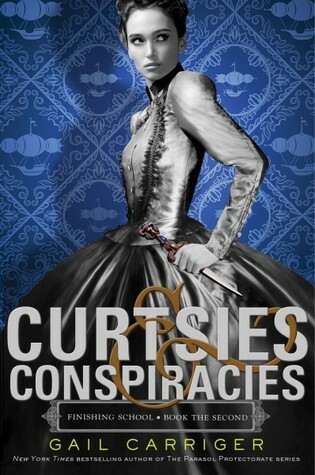 I completely adored the Parasol Protectorate series, I eat up the companion manga collections and I'm completely in love with her latest book, Curtsies and Conspiracies. Curtsies and Conspiracies brings us back to the world of Sophronia as she starts her second year at Mademoiselle Geraldine's Finishing Academy for Young Ladies of Quality. While the school sounds like a place for young ladies to learn how to move in society, it really teaches young ladies how to be spies and assassins. The school is even in an air ship that floats over the English highlands. It's another year of madcap adventures and conspiracies, written in that fantastic voice that Carriger possesses. There are insanely ornate Victorian names, enough wry wit to power a zeppelin and a few glimpses of some fan favorite characters (our dearest Lord Akeldama is back!). Curtsies and Conspiracies takes place a few years before the Parasol Protectorate series so a few very important characters flit in and out. It's fascinating to see them younger, before Alexia meets them. Sophronia and her friends have their work cut out for them this time. Some boys from the evil genius school come aboard their air ship and all hell breaks loose. There's flirting and crossdressing and a vampire plot that kept me on the edge of my seat! It was a fitting new entry into the series and I can't wait for the next one! Carriger writes such amazing characters. Sophronia is an incredible protagonist and a joy to read about. Her friends and enemies are equally as well written and fascinating. Even secondary characters are lovingly written. The plot is simple and yet becomes so much more. A special air ship is being debuted in London and the floating Finishing School is going to watch. Vampires and people who hate vampires get involve and clash violently. While Sophronia tries to figure out what's happening and stop them before anyone is killed, she has to dodge the affections of an annoying boy who calls her a pet name and is shocked when she doesn't simper and flirt like all the other girls. As if that wasn't enough, someone keeps trying to kidnap her best friend! The book flew by and I was said to reach the last page, but the next volume will be out next year. It was a perfect bon mot of a story and I just can not get enough of Gail Carriger and the world she has created. You need this book in your life. Trust me. I have GOT to start this series as I loved the Parasol Protectorate!